Your special day can be made more exceptional with the choice of rings you decide to exchange. Materials the small symbol of “Your world is wrapped around mine” is made of signifies different meaning. Diamond which is the choice of most couples represents “forever”, Rubies another choice represents love, keenness and grandeur, and Gold represents “purity”. Irrespective of your precious stone choice, Ram Parkash Sunderdass & Sons (RPS) will help you craft a memorable his and hers wedding rings perfect for your special occasion. Our collection features creatively designed wedding bands that best represent your everlasting promise of love. From indestructible diamond to strong and long-lasting alternatives like tungsten and titanium, we have something special for everyone. RPS bespoke jewellery designers can also help you engrave your love story on your precious bands. 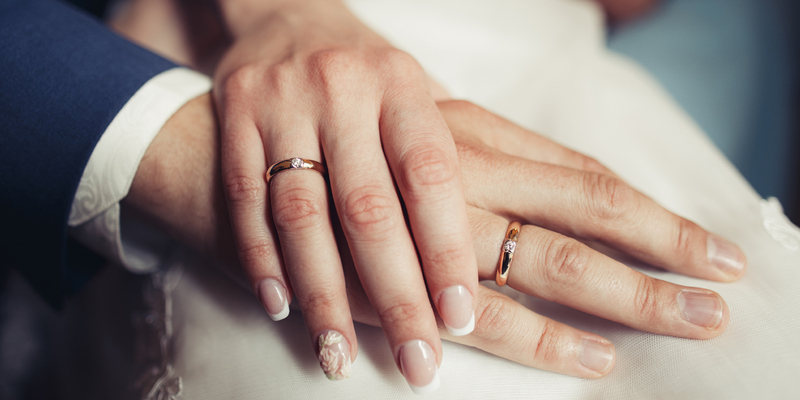 We have helped happy couples engrave their personal favourite like or word during courtship on their his and hers wedding rings to always remember when the going gets tough ― that is true, all marriage will sometimes face difficulties. Lovers who are far apart from each other get an engraving of longitude and latitude to always remember no matter the distance, love will always keep them together. We have had couples who engraved a half picture of a heart on their rings signifying they complete each other. The latest innovative engraving invented by our designers is the fingerprint, where you have each other’s left hand ring finger’s print engraved on your his and hers wedding rings signifying how your uniqueness and difference makes you a perfect couple. Check out our collections for your perfect love symbol or contact us to get a specially designed jewellery for your most memorable day. We are well-known for keeping the smile on new couples faces. Marriage is a divine union of two souls while a grandeur and elegant ring is a representation of this memorable event.